As you may know if you read this blog regularly I have a bit of thing for fringing. I don’t own much myself but when I see say a bag or top or jacket in the shops with even just a hint of fringing I am drawn to it, like a magpie is to shiny things. This may explain my love for Sarah Burton, from University of Westminster’s, collection at Graduate Fashion Week. Her collection was a take on a modern day flapper. 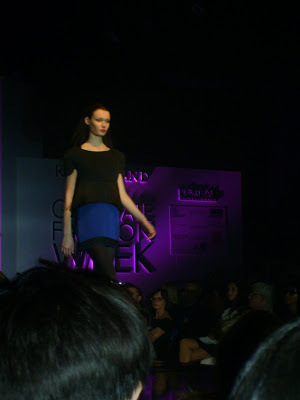 The colour palette looked luxurious in deep reds, blues and black. She actually paired blue and black together and proved it does work. She showed dresses with fringing around the hemline and across the chest, tops with fringing falling from just under the bust line and skirts with the shortest of fringing just above the hem so it sits on the skirt. I love the shortness of all the hems. My absolute favourite was this red playsuit. It looks sophisticated and well made but retains the idea of fun. I would love to pull this on and go for a dance just to watch all the fringing move. It has a sailor-esque bib front with the famous fringing on the arm sleeves and the shorts. I like the way it slims the silhouette, with the fringing on the short seemingly elongate the leg line. The judges obviously loved Burton’s collection as she won the Pringle of Scotland Visionary Knitwear Award. I can’t wait to see what she does in the future. I’m also a bit miffed I didn’t see her stand and have a look through her portfolio. And your should DEFinitely DIY a crop top, darling! Hello's I just saw your comment over on my little blog…I can relate, as I graduated last year too. And yep my pals who didn't continue 'higher education' are miles and miles ahead of me. Hun,: YOU WILL BE A TOP FASHION WRITER, SO HANG IN THERE!!! love the new flapper thing, it looks great. hope she does well in the future. fringe is always so much fun..I'm sure I'll see more of her in the future!